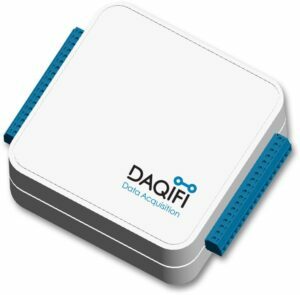 The DAQifi Nyquist range of data acquisition devices are one of the best examples of a new breed of data acquisition devices. In comparison to DAQ cards, these innovative devices offer a huge range of advantages. In high-end manufacturing and scientific processes, the ease of bringing together multiple data acquisition processes saves much time previously spent manually aggregating data. In situations where space is tight, or the system under study is inherently mobile, the portability of these devices makes them ideal. And last but not least, the price of Nyquist devices means that they are within the budget of DIY hobbyists, who are therefore able to bring powerful data acquisition techniques to bear where this was previously thought impossible. First, let’s take a look at what distinguishes DAQifi Nyquist devices from their primary competition – dedicated DAQ cards. Perhaps the biggest advantage of these devices is that they utilize WiFi networks for outputting data. This has huge advantages over traditional DAQ cards, which typically have a hardware link to a dedicated PC workstation. If you want to collect data on various different processes, having your DAQ devices streaming this data to a central location is great, not least because it saves money on having to invest in separate computer hardware for every data acquisition process. In addition, the fact that Nyquist devices can generate their own WiFi network means they are enormously useful for situations where the system being studied is inherently mobile – as in race cars, for instance. In DIY applications, these advantages can be supplemented by another – the fact that DAQifi Nyquist systems are significantly cheaper than dedicated DAQ card systems. This is because DAQ cards are often made to be used to collect one type of data only, and in many cases this means that a bank of cards must be used in order to collect even quite basic data. The flexibility of DAQifi devices makes them cheaper to implement in many situations. In addition, the user interface which comes as standard on DAQifi devices means that using them is incredibly simple in comparison to many DAQ card solutions. No knowledge of proprietry data programming languages is needed, which is great for the DIY hobbyist. In contrast to high-end scientific applications, in most cases DIY data acqusition is about getting the relevant data into one place, quickly and easily, for later analysis. This is exactly what DAQifi devices achieve, and it is therefore not surprising that they are eclipsing DAQ card solutions in many situations, from high-end manufacturing right down to amateur DIY projects.